Some of The Grand Piano's authors (along with others) collaborated on earlier essays. 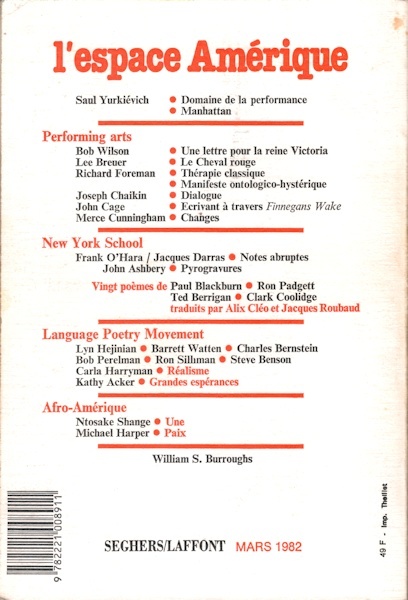 Several of The Grand Piano's authors were featured along with other Language poets in l'espace amerique, the March 1982 issue of the Paris magazine Change guest-edited by Nanos Valaoritis. 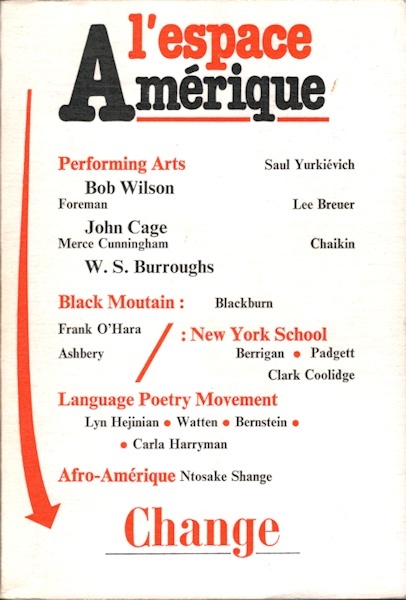 Steve Benson writes: "In early March 1981, Lyn wrote to Barrett, Bob, Charles Bernstein, Ron, and me proposing that we each write a page on a topic she named, the whole to serve as an Introduction to a selection of Language writings translated into French for the issue." (Note, the Introduction was retranslated into Serbian in 1989 and published in an issue of Delo, in Yugoslavia.) Download the Introduction. 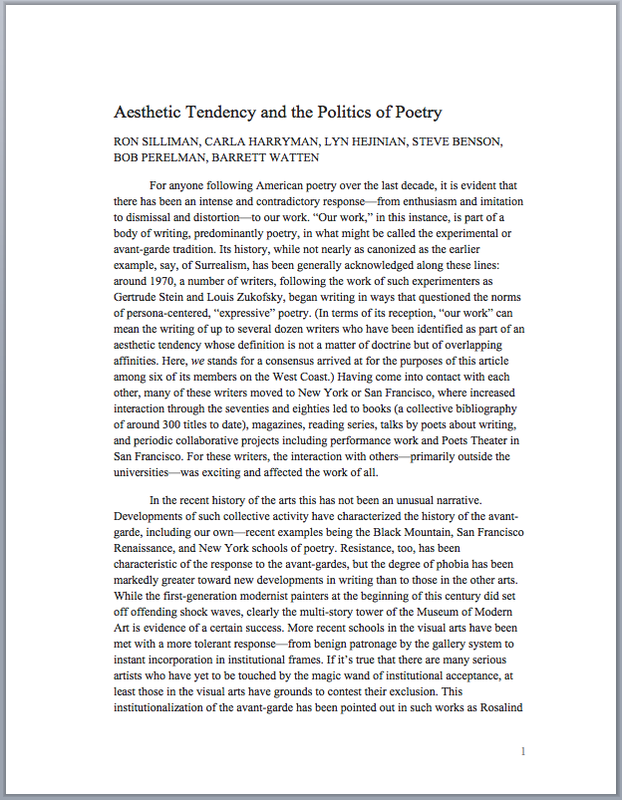 Benson, Harryman, Hejinian, Perelman, Silliman, and Watten collaborated to write "Aesthetic Tendency and the Politics of Poetry" in 1987, largely to clarify the orientation and goals of Language poetry from the point of view of some of its makers and to correct misunderstandings that had been circulating in other press. The reputation and identified values of Language writers and their work had been contested and subject to considerable and various representations in that period. Each writer began by drafting a section of the essay. The final version developed through discussion and editing by the whole group. It was published in the Fall 1988 issue of Social Text #19-20, a journal of "Theory/Culture/Ideology" located in New York.. When published in the journal, the text had been altered unintentionally due to technical circumstances beyond the control of its writers. The edition posted here has been brought into alignment with the final draft agreed to by consensus of the six writers, based on manuscripts, notes, and correspondence from the time of its composition and the writers' initial responses to it on the printed page. The notation "A Manifesto" as a subtitle, not intended by the authors, has been removed. The document linked here is authorized by the writers to be as historically accurate as possible and may be useful to those who have been interested previously in the Social Text version, which is still available elsewhere on line. Download the essay.